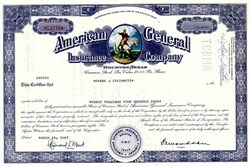 Beautifully engraved certificate from the American General Insurance Company issued before 1970. This historic document was printed by the Federated Banknote Company and has an ornate border around it with a color vignette of George Washington on a horse. This item has the printed signatures of the company’s president and secretary and is over 39 years old. American General Life and Accident Insurance Company is a member of the American General Financial Group. American General Financial Group is the marketing name for American General Corporation and its subsidiaries. American General Corporation is one of the nation's largest diversified financial services organizations. Headquartered in Houston, American General Corporation is a leading provider of life insurance, retirement annuities, and consumer loans to 12 million customers. American General Life and Accident Insurance Company was incorporated February 28, 1900 under the laws of the State of Tennessee as “The National Sick and Accident Association of Nashville.” The Company became a wholly owned subsidiary of NLT Corporation (NLT) in 1968. In 1982, American General Corporation (AGC), based in Houston, Texas, acquired NLT and its subsidiaries. The Company adopted its current name in 1984. In 1991, Gulf Life Insurance Company was merged into American General Life and Accident. In 1997, The Independent Life and Accident Insurance Company merged into American General Life and Accident. Also in 1997, Home Beneficial Insurance Company merged into American General Life and Accident. American General Life and Accident was acquired, along with its parent company, by American International Group, Inc. (AIG) in 2001. AIG American General, www.aigag.com, is the marketing name for the insurance companies and affiliates comprising the domestic life operations of American International Group, Inc. (AIG), including American General Life Insurance Company. AIG American General companies offer a broad spectrum of fixed and variable life insurance, annuities and accident and health products to serve the financial and estate planning needs of its customers throughout the United States. American International Group, Inc. (AIG), world leaders in insurance and financial services, is the leading international insurance organization with operations in more than 130 countries and jurisdictions. AIG companies serve commercial, institutional and individual customers through the most extensive worldwide property-casualty and life insurance networks of any insurer. In addition, AIG companies are leading providers of retirement services, financial services and asset management around the world. AIG's common stock is listed in the U.S. on the New York Stock Exchange as well as the stock exchanges in London, Paris, Switzerland and Tokyo.